We are delighted with our lovely studio – it is bright, light and airy, with plenty of space. We have a sprung floor, dimmable lighting and new Far Infrared heating which feels like the warmth of the sun. Far Infrared heating is used in incubators for premature babies and by Nasa. It heats objects rather than the air, so is helpful for those with allergies (you get fewer particles floating around on warm air currents) and promotes repair of muscle fibres by increasing circulation. 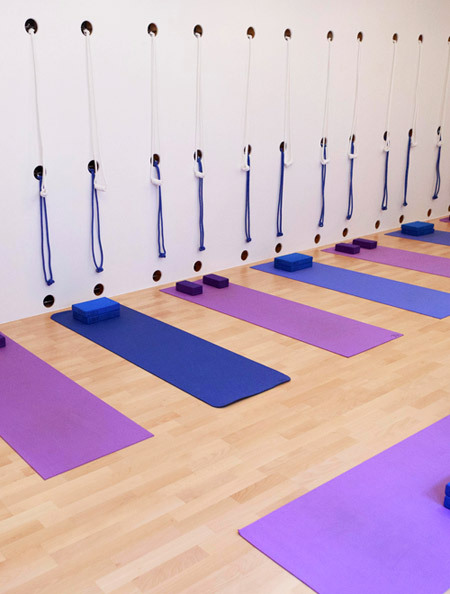 All yoga equipment is provided, although many people prefer to bring their own mat and this is encouraged. There is a changing space in the reception area, space for shoes and clothes (at your own risk) and a small shop where equipment can be purchased. Yoga Now studio is on the 4th floor of St.Margaret’s House, an old office block which now houses an arts organisation, Edinburgh Palette. Art work and gifts made by artists who work in the building is available in the Yoga Now shop and there is a changing programme of exhibitions and events in the galleries on the third floor. The level of class you attend is not just decided by your level of fitness but also by your experience. Please read the class description before booking for a class so that you are aware of what is expected in each class. Beginners classes are the best place to start – you will learn how to work safely and how to adapt the poses to suit you. This is where we go over all the basics, everyone is new to the subject and you all learn together. If you have experience of another form of yoga, it may be useful to attend a few Level 1 classes first, to assess which level will suit you best and to learn how to use Iyengar equipment, especially in Inversions. In Level 2 and above, you will be expected to know how to set up your equipment for Salamba Sarvangasana (shoulder stand). If you are still unsure of which level class will suit you best, please do contact us lucy@yoganowstudio.co.uk and we will be happy to discuss it with you. It is possible to book one to one sessions with Lucy at the studio. These are useful if you have a health issue or medical condition that might prevent you from attending a general class. Usually, after a few one to one sessions, you will learn how to adapt the poses to suit you and be able to attend a general class. If you have health issues or a medical condition, it is very important to tell your teacher about it before you book into a new class. Most minor health issues can be accommodated in general classes but more complex or severe ailments may require one to one sessions and / or attendance at a Gentle or Therapeutic class. Ideally, you will start attending a regular yoga class before you become pregnant. Yoga is an ideal way to prepare the body for pregnancy and it also allows your teacher to get to know you, so they can tell what is appropriate for you once you become pregnant. We usually advise women not to attend classes around the 12th week of pregnancy, for a few weeks. If you are already attending a class when you become pregnant, we ask you to miss classes between weeks 8 – 14 of the pregnancy. If you are new to Yoga Now, we ask you to start classes from week 14.